Bullfrog 2, Where art thou? Back in May of 2007, I announced that Bullfrog 2 development had begun. The game engine was to be entirely rewritten to accelerate graphics by using OpenGL and to add many of the game play features I always felt were missing from the original Bullfrog. Then in September, I shared with you a short movie showing a very early version of the new game engine. This was all targeting the Mac, just like the original. While I was very excited about the project, Marcus and I were quite busy with other projects and development was slow. But, just as our schedules began to open up a bit, Apple announced that they were allowing third party developers to write software for their new iPhone. I guess timing is everything. Within hours of the announcement, we had decided to change directions and target the iPhone and attack the world of mobile gaming. After more than a year since the original announcement and four months of intense development on a brand new and very exciting platform, the original vision was released. 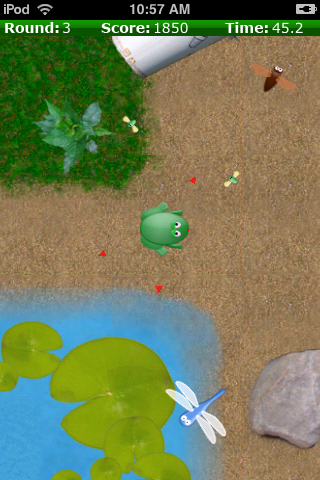 Bullfrog Touch sports a fast graphics engine, accelerometer-based controls, beautiful scrolling maps, animated water, obstacles, and my personal favorite lily pads. But, the most exciting part of this whole journey is the huge list of ideas we generated while working on this project. The iPhone and iPod Touch platform is an extremely powerful environment for all kinds of software. The ability to take your iPhone anywhere you go and have the full power of OS X under the hood is sure to lead to some great things. Marcus and I have been working hard on Bullfrog 2. There are many technical hurdles we’ve been navigating through, but it’s been fun so far. We promised to keep you up to date with progress and discuss the technical challenges we’ve encountered. So far the challenges have been all due to our lack of experience in the new technologies we’ve chosen to use. Open GL has been a bit of a change from drawing in Cocoa, but once I worked out the “little” problems getting the code to work on multiple graphics cards it’s been mostly smooth sailing. The biggest challenge has been getting up to speed with the new Leopard technologies. We really want to write about this stuff, but can’t yet because of the NDA we’ve agreed to with Apple. Hopefully, we’ll get to talk about that stuff soon. But, to show that we are making progress here is a short thirty second movie of our little green hero hopping around a small test level. Keep in mind this is uses very rudimentary developer artwork I created just to test the screen scrolling and background tiling code. But, it does give a small peak into the direction we’re taking Bullfrog 2.